Emily Radaker is passionate about her healthy lifestyle and shares that passion with those around her. A life-long runner, kickboxing instructor, yoga student and Insanity DVD junkie, Emily is no stranger to exercise. “I am constantly challenging myself to push harder,” she says. When Emily left public accounting to work as an internal auditor for Meritus Health’s business integrity department, the health system gained a natural fitness leader. “I’m thrilled to be working in an environment where employee health is promoted,” says Radaker. Soon after joining Meritus Health, Emily became a member of the health system’s wellness committee and suggested a running club to help employees prepare for the fall Meritus Health’s Pumpkin Dash 5K Fun Run/Walk. In late July, Emily led the Fit to 5K program where, two times a week, 25-35 employees would stretch, walk and run their way to improved endurance. “I wanted to convey to the participants that being active is not intimidating. I would tell them that I didn’t care how fast and far they would go, as long as they were moving forward,” says Emily. Throughout the eight-week program, Emily sent participants motivational quotes to encourage them to stay committed to the program. For Emily, the icing on the cake was seeing 30 of her “students” participate in the October 5 Meritus Health 5K Pumpkin Dash. While many of the runners/walkers reported their best personal times, one Fit to 5K member placed second in the 60-year-old age group. 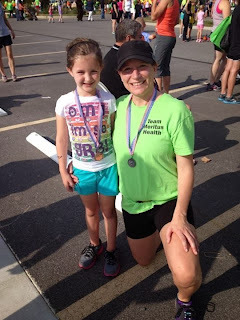 Emily garnered second place in the 30-year-old age group and her daughter nabbed the silver in the girls 14 and under category. After race day, Emily continues to balance a demanding professional schedule, family life and workouts. Both Emily and her husband value exercise time and place it high on the daily agenda. She tries to increase the amount of time she works out at home and encourages her children to jump in and participate. “There is nothing cuter than a seven- and nine-year-old doing pushups and burpees,” she says. According to Emily, exercise helps her reach her full potential at work by giving her more energy and improved concentration. While she still allows herself to live a little, Emily doesn’t eat unhealthy food as she did in the past. She discovered that when she would “put junk in,” she would “get junk back out” when trying to workout. Emily also drinks more water than ever before and rarely drinks soda. “I learned how much more amazing I feel drinking water!” she says. With the Fit to 5K and Pumpkin Dash under her belt, Emily is eager to participate in more Meritus Health wellness programs. She hopes to be the organizer and communicator for a proposed running/walking club. With group exercise, says Emily, individuals are motivated to be team players and be held accountable to the group. So You Need Outpatient Surgery….